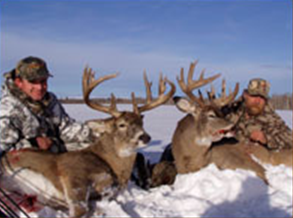 Whitetail Hunts - Guinn Outfitters Ltd.
Our family has been hunting the mountains and foothills of the Alberta Rockies for four generations. We are the oldest outfitting company in the province. In 1993 we teamed up with C.L. Ranch to manage and operate a deer hunting operation. The Ranch is situated in the Chinook belt, west of Calgary, which means our deer population is not affected by winter weather as is the case in other parts of the province. With thousands of acres of prime deer country our success is over 95%. All hunts are fair chase (no fences here). Our deer hunts are limited to 16 hunters spread over the month of November. Spot and stalk is the normal hunting method with a little stand hunting. With very little hunting pressure, deer can be seen throughout the day. A normal day one might see well in excess of 100 Whitetail and half as many Mule deer, several of which will be bucks. The past three years our average is well over 150 points Boone & Crocket, with some over 180. Although most of our hunters are rifle hunting, we do have very high success archery hunting, most of which will qualify for the Pope & Young. 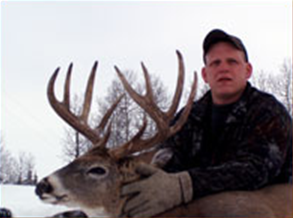 Mule deer hunts are not sold separately, but can be added onto the Whitetail for an additional fee. These must be pre-booked to assure permit availability. All guides that we employ are very experienced and do their best to see that you not only have a successful hunt but an enjoyable holiday. 2 on 1 guide ratio is the norm and works quite well, but if you do require your own guide we can do that and an additional fee to cover guides wages. Accommodation is a cozy ranch house, situated a couple miles from the main cattle ranch operation. Meals are first class, prepared by our camp cook that has over 20 years experience, so plan on putting on a few pounds during your stay with us. All hunting is done within a 30 minute drive from the cabin. Hunters fly direct to Calgary, Alberta from most major cities in the U.S. where we meet you on arrival and then it is a short forty five minute drive to the ranch.